The tilt-head feature a generous 5-quart capacity making the KitchenAid Artisan Stand Mixer the ultimate in user-friendly design. 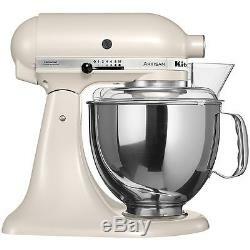 Features 10 speeds and KitchenAid's unique planetary mixing action, driven by a powerful 325-watt motor. Rugged all-metal construction ensures long life and quiet operation, and rubber feet anchor it securely while in use. The Artisan has a 5-quart stainless steel bowl, with ergonomic handle and clear plastic pouring shield, but it can also accommodate the 3- and 4.5-quart bowls. 325-watt mixer with 10 speeds; 5-quart stainless steel bowl. Tilt-back head for easy access to mixture. Includes flat beater, dough hook, and wire whip. Measures 14 by 8-2/3 inches by 14 inches. ATTENTION ALL CUSTOMERS: ALL ELECTRONIC ITEMS ARE 110V. The item "KitchenAid Stand Mixer RRk150LT Tilt Refurb Artisan Tilt Cafe Latte" is in sale since Thursday, December 17, 2015. This item is in the category "Home & Garden\Kitchen, Dining & Bar\Small Kitchen Appliances\Countertop Mixers". The seller is "usa-world-sales" and is located in WE COMBINE SHIPPING YOU SAVE $$$$$$$$$.